Butter Lettuce: The leaves are thin and soft with a silky almost buttery feel. They have a sweet, mild flavor with less prominent veins than iceberg. 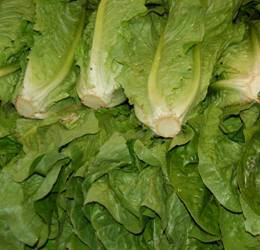 Butter lettuce is sometimes referred to as cabbage lettuce and includes common varieties like Boston and Bibb lettuce. Escarole Lettuce: Escarole is a lettuce that is often used in salads. With a crinkled shape to the leaves, escarole is an example of greens that provide various degrees of flavor as the outer leaves are removed. While the outer leaves are a dark green, peeling back a layer will reveal a lighter shade of green. As more layers are peeled back, the leaves continue to lighten in shade. As the shade of the leaves lightens, the degree of bitter taste also lessens. 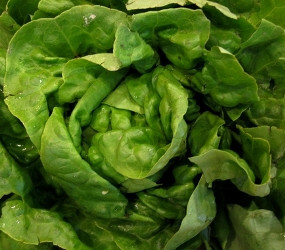 Iceberg Lettuce: Sometimes called Crisphead lettuce, Roundhead lettuce, Iceberg lettuce or head lettuce, this popular salad green has a tight compact head, pale green leaves, crisp texture and a very mild flavor. Store in perforated plastic bags wrapped in damp paper towels and keep in the refrigerator vegetable crisper. 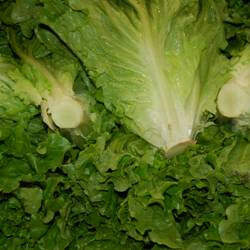 Green Leaf Lettuce: This is one of the most common varieties and has curly, ruffled leaves. Their crispness falls somewhere between butter and romaine lettuces. Modern lettuce had its start as a Mediterranean weed. As early as 55 B.C., lettuce was served on the tables of Persian kings and praised for its medicinal values. The name comes from Latin words referring to its milky juice. Red Leaf Lettuce: Red leaf lettuce’s mild flavor and soft, colorful leaves makes it a popular addition to salads. 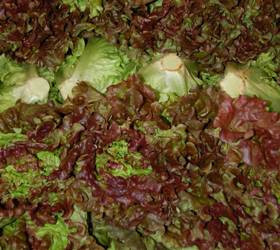 This is the red version of green leaf lettuce which is one of the most common varieties and has curly, ruffled leaves. Their crispness falls somewhere between butter and romaine lettuces. Lettuces like moisture and cool temperatures. Romaine Lettuce: Romaine or Cos lettuce has a loaf-shaped appearance with long, dark green, upright outer leaves that often feature a white central spine. 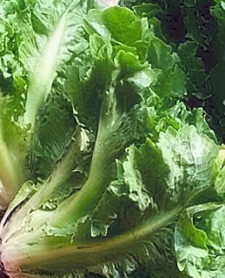 The outer leaves can be quite sturdy, while the inner leaves are often used in Caesar salads and are on the tender side. 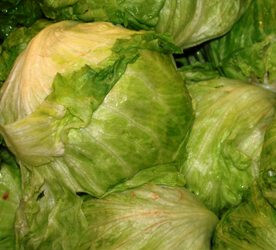 The word lettuce derives from the Latin word “lac” or “milk” because of the milky juice that comes from the cut leaves.